I am one lucky woman. My mom, The Bean, loves to spring for tickets to literary events --our deal: she gets tickets and I try to get the food --she usually wins the draw and reaches her wallet first. Together we've experienced wonderful authors including Diane Rehm and Maria Doria Russell, click the links to read our adventures. 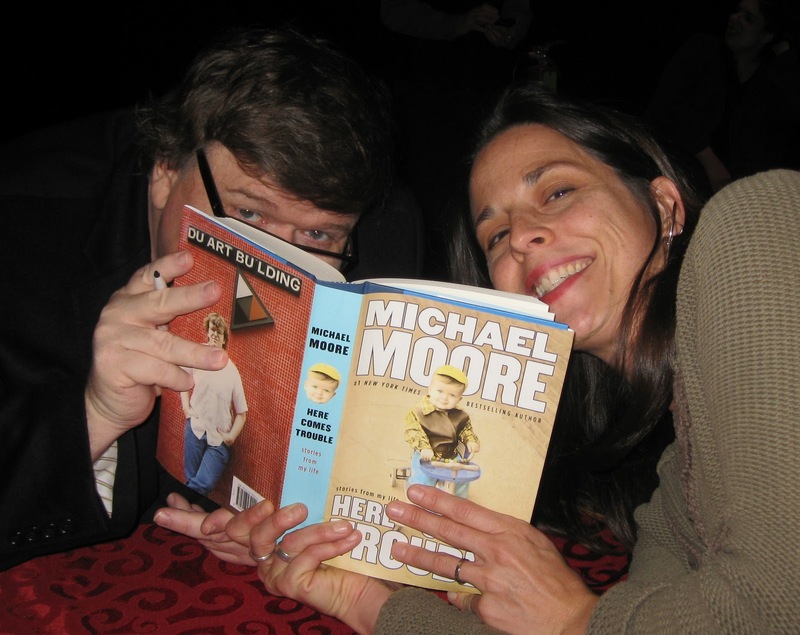 Recently she treated to "An Evening with Michael Moore" at Traverse City's State Theatre. Before Michael read from his new book Here Comes Trouble he shared a couple of lists. The first brought to light a simple fact: we all have things in common, if we take pause and really give it a chance. Michael and I, we don't tighten lids; Michael and my brother, share a middle name --Francis; Michael and my family work hard to get along with neighbors (he even lived through neighbors spreading manure on his lawn); Michael and myriads love movies, books, libraries, and our moms. I really whooped and hollered when he shared number six of his second list, Ten Things We Want: A Proposal for Occupy Wall Street: End Wars, Fund Libraries. Could it really be that simple? Well, of course there is much more to it --but that simple thought I am happy to share with The Sisters: fight less, learn more. Here at Books for Walls Project we are always in the lookout for ideas that help libraries, especially with funding. During his book tour Michael is going the distance for libraries. In his home town of Flint, Michigan (free event, half price books) $10,000 was donated to the Flint Public Library. In fact, on every stop a portion of book sale royalties are donated to a local library. We're trying to find out which Traverse Area District Library will receive the Traverse City event royalties, we'll let you know! Thank you Mike for posing "Books for Walls Project Style"
and thanks for taking the time to listen! Following a lively, cheering, laughing, audience involved talk we waited in line to get books signed and chat with Michael Moore; his charisma and ability to speak his truth is what America could be all about. He took a moment to hear our abbreviated stories --that The Bean (my Mom) and The Poet (my Dad) met on the streets of Detroit during the riots on April 4, 1968 when Martin Luther King, Jr was shot, then married and raised three children just blocks away; we told him about BFWP and our Library Love plans --he listened as he signed his name. The night was about listening. Listening to him talk about his life, running for school board, twenty-somethings, his mother and his love of reading and oh yes, his love of movies, listening to the audience react, listening to my Mom laugh, wondering how I will do a better job listening to everyone I meet. After our evening with Michael Moore and a theater full of hopeful people there was no way this Mom will ever wonder if the future of the world is all right. In our perfect world libraries don't have to wonder how to remain open, which books to buy, and what services to provide. In our perfect world the knowledge that gives Americans power would be available 24/7 to every citizen --any age, with or without an address. We are giddy to imagine that world. We invested in two copies of Here Comes Trouble (that's $10 to help the State Theatre!) one for our personal library and one for YOUR favorite library. Would you like us to donate a signed, 1st edition to your library? Drop us a line info@booksforwallsproject.org, or post a comment, tell us about your favorite library --we'll collect the entries over the next couple of weeks and then The Sisters will pick one in a random drawing. Interested in reading Here Comes Trouble? May we suggest borrowing a copy from your library, find it www.worldcat.org. Send Michael Moore a love letter (we think this is his email address!) or visit his Facebook page ask him to link to local bookstores on his website and tell him the Books for Walls Project send you --and don't forget to thank him for supporting our libraries! Stop by again soon! We have all sorts of fun planned for December! I'd like to make a suggestion that your autographed copy be granted to the Benzie Shores District Library branch in Frankfort, MI. The staff is sweet & helpful & the setting is one of my very favorites... you can sit near the window closest to the bay and in between inspirational tidbits of prose or poetry, you can take a deep inhalation, and take a look at the lovely northern Michigan landscape (and if time permits, take a fabulous walk on the trail just out the window; perhaps to the beach, where waves crash & splash). Daydream over. Thanks Books For Walls for your ever-present activism! You inspire me to no end! GREAT photo with MM peering over his book! Thanks, Amy and BFW for the inspiration! love this! esp the photo! :) I also love the Frankfort library. The Frankfort Library doesn't let people out of the property tax area check out materials without paying $100+ per year for a library card. Not very PUBLIC. The Cottage Bookshop in Glen Arbor is another indie bookstore in the area. They support their local library and community. benzie shores in fkft is a DISTRICT library~ not a public library~ so their operating costs are quite differently funded than a public library~ it is a great library, and I love it alot, but how about Mills in Benzonia? I FEEL the presence of old fingertips turning pages when I am in there... northern Michigan history comes alive insode Mills & I like to imagine I am in a book myself! Is it a mystery? Or is it a comedy of errors? I like to smooth wood on the walls, the tall ceilings, the old maps, and the trees out back, the park next door, and though the busy highway is just outside the door, I always feel a world away!